I boarded a boat from my “iskelesi” (historic passenger ferryboat pier) at Besiktas that took me to Emirgan, Kucuksu to Beylerbeyi and back again. I passed the real and the fantastic in equal measure with loveless dilapidation beside stunning palaces symbolising both the city’s modern economic struggles and her glorious bygone eras. Huge flocks of seagulls made me realize what fun they must have as they flit and settle and help themselves to a plethora of fish. Further, frenetic movement comes from the bustle and hustle of people busy making a buck or rather a lira; all in stark contrast to the grounding, anchor-like status of the buildings. Along the banks the milky teal water lapped at both “yalis” (summer residences built of wood) and, on the European side, the glorious miniature Ortaköy Mosque and, on the Asian side, the imposing Küçüksu Summer Palace, a rococo building whose two bowed balconies on consoles added to the staggering beauty of its façade. I kept comparing Istanbul to Venice in terms of the light, the water, and its sea traffic. The confluence from the Golden Horn resembles Venice’s Bacino. Even the domes of the mosques punctuate the skyline like the churches along the Giudecca. As the fog rolled in and dusk descended, the blurred lines shone from the shore, indicating “yakmoez” (the effect of moonlight sparkling on water). I stayed at the Four Seasons Bosphorus , a former palace and gardens with an impressively neat and formal layout. What a great front row seat from which to see out over the Bosphorus and beyond to Asia and in walking distance of the Dolmabahçe Palace. In the mid-19th century, as the Ottoman Empire had aspirations to westernize, the Sultan abandoned the Topkapi and moved to this palace where Ataturk died in 1938. It’s an enormous edifice of white marble and by far the grandest imperial Ottoman palace on the Bosphorus: ornate, luxurious and opulent with its Baccarat crystal chandelier, beautiful Hereke carpet and Chinese vases. Dolmabahçe means “filled-in garden,” and this former inlet was made into a royal park with beds of scented flowers and shrubs surrounded by an imposing wall only penetrable through two gloriously elaborate grilled gates. Topkapi Palace itself is a classic fortress, with its strategic defense from the confluence of waterways, and was home to the sultans for almost 400 years. Like Venice’s Doge’s Palace, it’s all too easy to overlook the bloodshed to pay homage to its beauty. Mozart found inspiration for his Abduction from the Seraglio and Melina Mercouri and Peter Ustinov starred in Topkapi, the 1964 film about the theft of the sultan’s emerald-encrusted dagger. 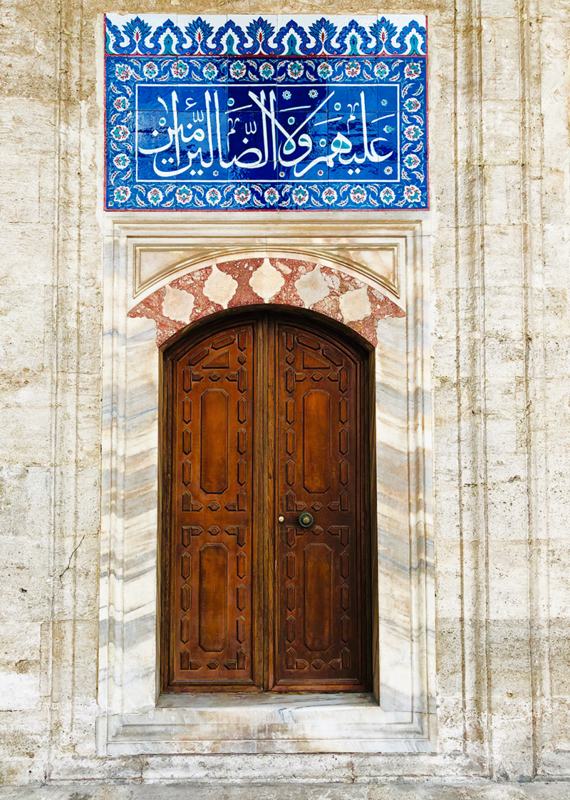 Set amongst plane trees and cypresses, the buildings offer an explosion of color from the Iznik tiles whose different designs work successfully. I loved all the vibrant hues of blues and the explosion of surface patterns all coexisting in an eclectic mix. Both within and outside the spacious rooms are as richly consuming as courses of a banquet. The Konyali restaurant is on site and it’s a great break between visiting the palace and the harem. It’s an old-fashioned restaurant serving up the surprise of excellent food in lifting the metal plate cloches with synchronized theatricality. Afterward, I stepped outside onto the palace balcony to look out over the confluence of waterways and feel the gentle breeze coming off the Sea of Marmara. The Hagia Sophia, another of the city’s must-see attractions, was built at the command of Emperor Justinian in the years 523 to 537 it’s the city’s oldest and largest building and every brick remains intact. Having been the third church to stand on its site, once for Christians and then for Muslims, it’s now a museum and is particularly impressive not just for its history but for its scale as an architectural feat with its many buttresses. 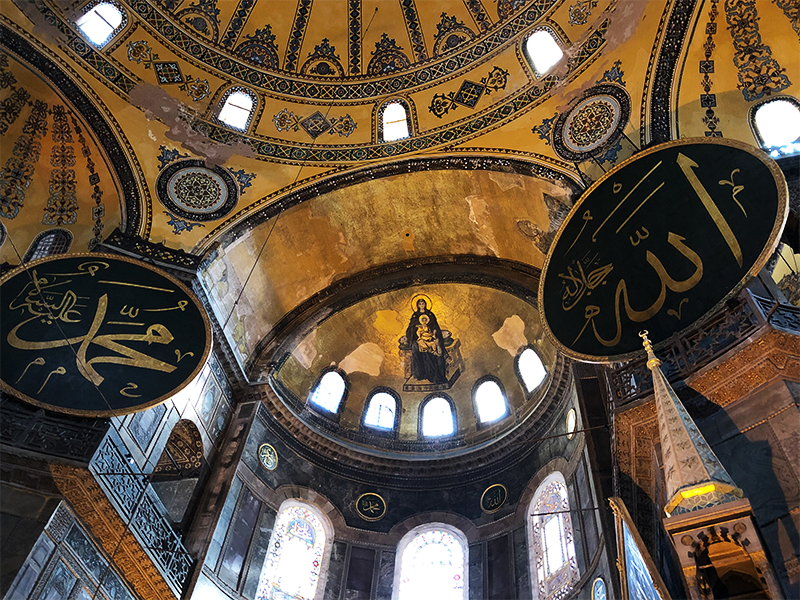 I felt a real excitement walking up the vast nave and standing under the great dome that the Byzantines deemed suspended from heaven by a golden chain. What assuredly are suspended are eight of the world’s largest calligraphic “levhas” (roundels). 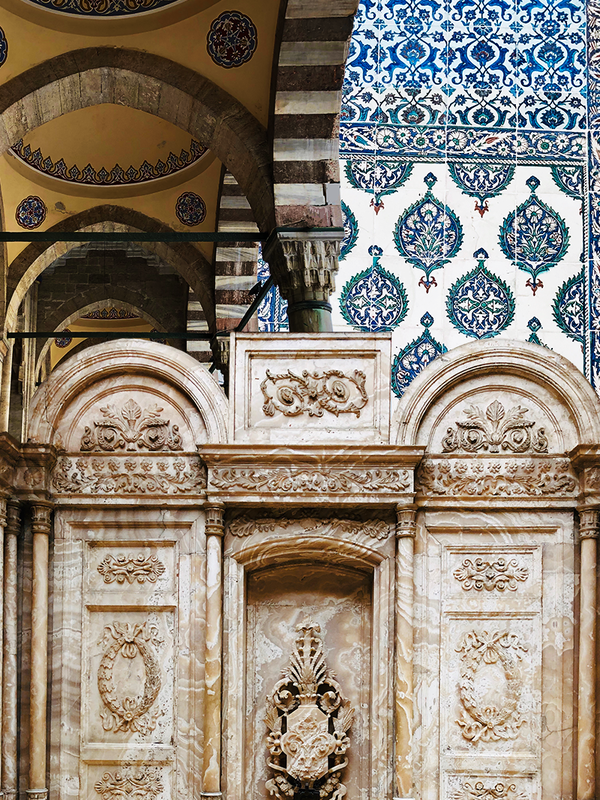 It’s also where Sultan Murat IV installed cages with nightingales for their sweet notes to mingle with the voices of the muezzins. 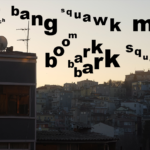 Certainly, I felt more than once the winning combination of seagulls and the muezzin’s megaphone, whose call to prayer stopped me in my tracts as it echoed the neighboring six minarets of the Blue Mosque. For further along the clean and traffic-free Roman hippodrome that plays host to some smaller attractions, is the Blue Mosque with its stunning symmetry and magnificent series of domes and semi-domes and its spacious courtyard with grandiose yet elegant proportions. Despite the mosque undergoing massive restoration I managed to get a glimpse of its glorious interior and the stunning tiles from the workshops of Iznik and Kutahya. I walked up a steep hill past Ottoman-era wooden houses to look back spectacularly over the Haliç (Golden Horn), the city’s primary inlet. I reached the Suleymaniye Mosque whose immense splendor and majesty was built to Sinan’s plans, the architect of 42 mosques in Istanbul. I had pointed out to me the camel skin drums placed in its dome for audibility. But the mosque Sokullu Mehmet Paşa Cami’i was my real “find.” It’s set behind an old wall with cats on the cobbled street that meandered downhill towards the Sea of Marmara. I had it all to myself with just the one pair of shoes outside and the silence amplified the décor and the ambiance as the sun shone through the colored glass panels onto the turquoise vine and flower motifs and added to a feeling of weightlessness within. 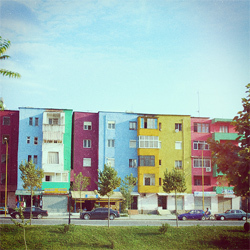 Indeed for all its dilapidation, Istanbul has no wilderness, no free space. Every vantage point is fought after like tropical plants for light. 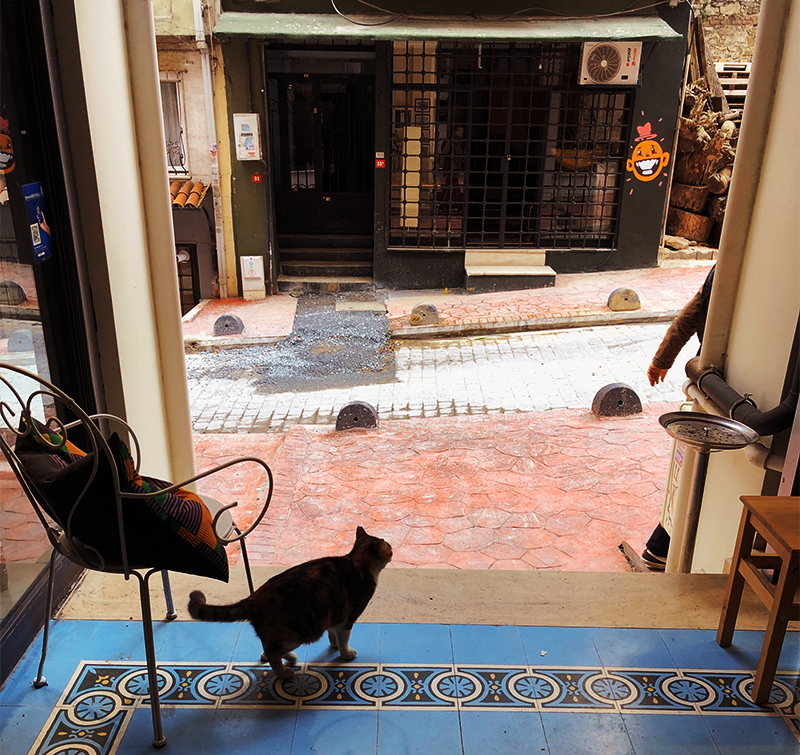 Galata is an area reminiscent of 19th century Montmartre. Untainted by urban chicness, it’s full of curiosity as it led me to a host of Aladdin caves comprising of antique and bric-a-brac shops. 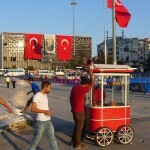 Nearby is the Pera Palace Hotel that proudly showed off its former glory. Room 101 was occupied by Ataturk, 103 is where Garbo slept and 411 where Agatha Christie wrote much of ‘A Murder on the Orient Express’, a copy of which was granted reliquary status in a glass cabinet beside the antique elevator which, along with the salons, ensures the hotel’s spirit endures. I stayed next at the nearby Four Seasons Sultanahmet, a spice yellow building and former jail until 1986. It’s fantastically positioned between the Blue Mosque and Hagia Sophia both of which I saw close up from the hotel’s rooftop terrace. From the hotel, I wandered down the Avenue of the Mat-Makers to the ropes and buckles, buckets, cooking knives, and hessian bags and baskets of every shape and size. A boy as young as 12 was carting bags of rags twice his size as others brought trays of tea to shopkeepers holding their fort. Nowhere amongst this cornucopia of emporiums could I find what I discovered in a Turkish dictionary, namely a “paçaci” (a man who sells sheep’s trotters) or a “cigerci” (a seller of liver and lungs)! 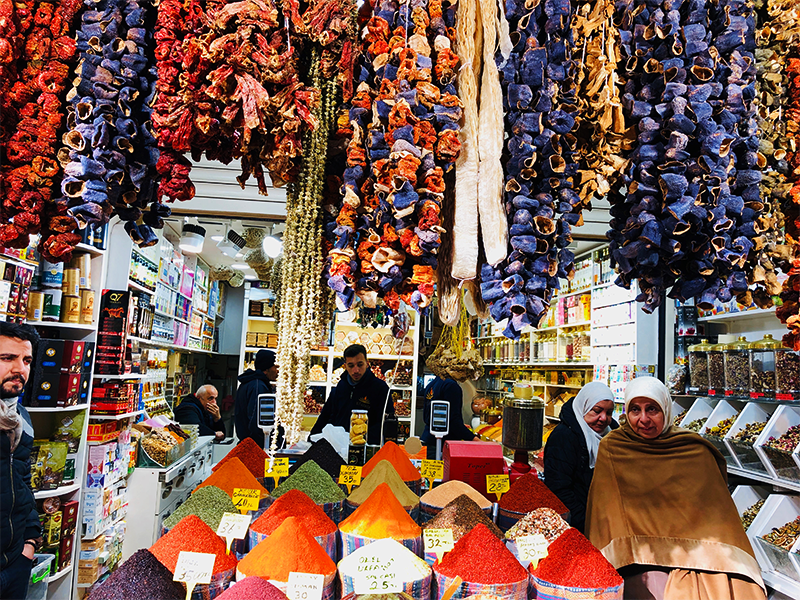 Formerly and still formally called the “Mısır Çarşısı” (Egyptian Market), the Spice Market is an L-shaped building. First organized into eight separate guilds that included the “Merchants of Musk Sherbets,” the market now has only six out of the 88 shops devoted to its original products. Adam wishes to acknowledge Four Seasons Bosphorus, Four Seasons Sultanahmet, as well as with the Hideaways Club for his stays and Atlasglobal for the flight to Istanbul.